Do you think it's a bit cumbersome when you need to switch symbols or timeframes with mouse click? 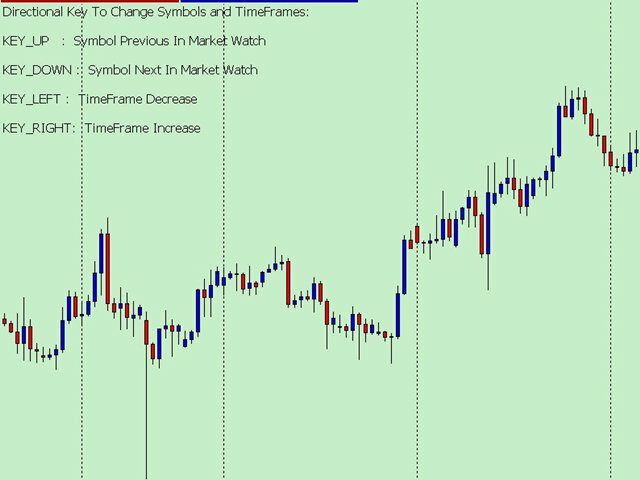 This is a program that can switch symbols and timeframes with direction keys. I wrote this program in the form of indicator. So you can load other EAs, indicators or run other scripts. This is DEMO version, you can only switch the first 8 Symbol in Market Watch. The direction key UP is to switch to the previous symbol in market watch. PS: When the chart is the first symbol, Key UP will switch to the last symbol. The direction key DOWN is to switch to the next symbol in market watch. PS: When the chart is the last symbol, Key DOWN will switch to the first symbol. The direction key LEFT is to decrease the timeframes. PS: When the timeframe is M1, Key LEFT will switch to the MN1 timeframe. The direction key RIGHT is the increase time frame. PS: When the timeframe is MN1, Key RIGHT will switch to the M1 timeframe.